Is It Worth To Play Baseball? →Is It Worth To Play Baseball? The time and effort that you spend in playing baseball should deliver useful results. Baseball is an interesting outdoor game through which there will be great fun and excitement. The game can be played by all age groups and parents can encourage their children to play from the early formative years. It is a great means to deliver physical exercise so that you will be able to stay away from various kinds of diseases. Obesity is the most daunting issue affecting both young and old. Hence, a baseball game can be played as a fitness activity so that there will be a great sense of satisfaction. If you are aware of the rules and regulations of the game, you will be able to play the game very efficiently. The foul making chances will be reduced and there will be great scope for making runs when you learn new techniques. You are advised to go through the videos of matches played by competitive teams so that you will gain useful insight about the game. The pros and cons of various positions and hits can be analyzed and best strategy can be implemented to win the game. Baseball is a great game for watching and it can be played to enjoy the game to the full potential extent. You should know how to play the game, baseball. It is a game played by two teams. Each team will have nine innings. In each inning, the team will try to achieve runs. The two teams are called the home team and visiting team. While the home team bats second, the visiting team will bat first. The batting team sends one player and he is called as hitter or batter. The pitching team will try to prevent the batting team from making the score. The hitter will face ball until three hitters are out. At the end of the nine innings, additional sessions will be played if the scores are counted as tied. A run will be counted after reaching the home base by touching the first, second and third base. At any point in time, there will be nine players on the field. However, a substitute can be brought to the game due to various reasons including fatigue and injury. The substitute will be present for tactical reasons as well. If a player is replaced by a substitute, he will not be allowed to return to the game. The baseball field will be in square shape. There will be four bases and they are called, first, second, third and home base. Each base is separated by a 90 feet distance. The pitcher’s mound is located in the middle of the square (diamond). It will be located 60.5 feet away from the home plate. The outfield will be surrounded by a wall. The wall is located about 325 to 450 feet away from the home plate. Some long hits are fair and others are counted as foul. You can find two foul lines which will extend to the wall from the first and the third base lines. The pitcher is the player who will throw the ball and it will be hit by the hitter of the opposite team. The hitter will stand on the home plate. The hitter should hit the ball within the foul lines. The ball should land in front of the foul lines and it should go in front of the first or third base. If the player runs without being tagged out, the runs will be managed. If a hitter stops at the base, he will become a base runner. He can make further advancement when the next hitter is at the bat. Thus, when the hitter runs, the other teammates will also run. If the hitter punches the ball outside the field, other base runners will make advancement to the home base. If the runner manages to reach the home base, he will score runs. A Hitter Can Be Out In Various Ways. If the hitter hits the ball and the ball falls into the hands of the fielder without bouncing on the field, it is called, ‘Flied out’. Fielders will try their level best to prevent a ‘home run’. Some players reach over the wall to catch the ball. The ball will fall on stands and dugouts as well. Fielders should be able to catch the ball in all directions as the fielding arrangement will be done by the captain to avoid runs and to catch the ball. ​If a runner is caught with the ball by a fielding team when he is standing away from the base, the runner is declared ‘put out’. The runner will also be declared out when he is not present at the base by holding the ball at the base. ​When the pitcher throws the ball, it should be thrown into the strike zone. The hitter will swing and fails to hit the ball. The zone above the hitter’s knees, below the waist and shoulders and over the home plate is treated as strike zone. If the pitcher can make three strikes on the hitter, it is declared as ‘Struck Out’. 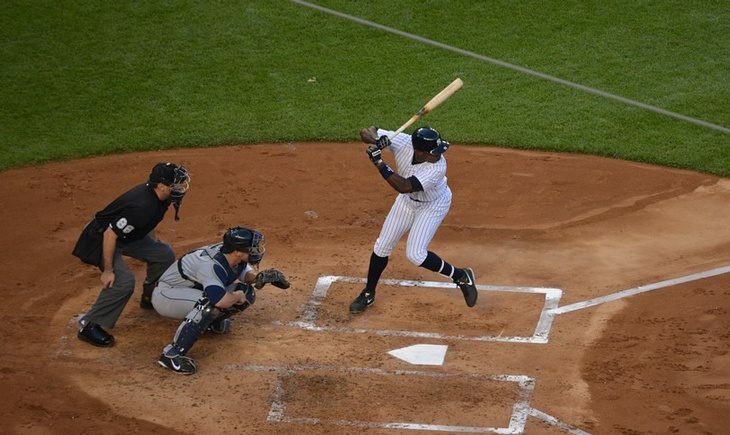 If the hitter swings at the pitch and fails to hit, it is also declared as a strike out. If the hitter hits a foul ball, it will be counted as strike out. ​If the hitter does not pitch and the pitch is not in the strike zone, it is known as the ball. After receiving four balls, the hitter manages free walk to the first base. It is also called as ‘base on balls’. ​If the fielding team can manage three hitters out, the inning will come to an end. The swapping of two teams will take place. The batting team will take the fielding team position and the fielding team will take the batting team’s position. The team which manages most runs at the end of all innings will be declared as the winner.